Bombers InterchangeCourtenay Dempsey and is possibly out for the game. GOAL BOMBERSWinderlich just inside the boundary with quick hands to Bellchambers, he gets it out to Crameri who has a hurried snap from around his body & slots it through! BEHIND SWANSHannebery receives the free, the ump blows advantage as Jetta picks up the ball, he runs into the open goal but the kick slams into the woodwork! The Bombers really need to start making more of their forward opportunities, they are getting it in there but cannot make the Swans pay on the scoreboard. BEHIND BOMBERSZaharakis unloads from just outside 50, it's a bouncing ball goal-ward but it bounces to the right of goals. Mitchell is warming up on the sidelines & these wet conditions will actually suit him! Walsh is in agony as he is carried to the rooms by the trainers. Swans InterchangeTommy Walsh off due to an injury. Walsh goes down whilst going for the ball with what looks to be a hamstring, he fell very awkwardly & is probably lucky he didn't sustain a knee injury as well. We are underway in the second quarter, the Swans lead by 2 goals & win the ball out of the middle. 1/4 time: Sydney lead by 2 goals, the wet conditions are suiting Sydney's game plan, the Bombers have been outnumbered at almost every contest. Essendon have had 16 inside 50s for just the 1 goal! BEHIND BOMBERSJetta sends the ball to the goal square, Crameri is outnumbered 3-1 & Richards punches it through for a rushed behind. 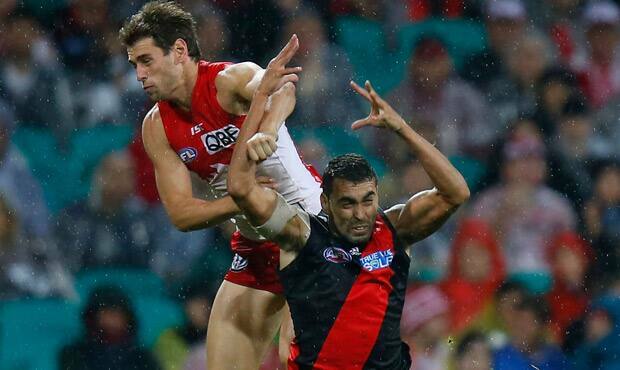 Essendon are really struggling to adjust to the wet conditions, they trail by 13 points. BEHIND SWANSParker unloads from 45, the kick falls short but it's a bouncing ball goal-ward, it bounces through the goal square & looks on target but bounces to the right of goal! Watson has the ball in the middle, he's dashing forward through traffic but there's no one home for the Bombers & Watson's kick inside 50 is met by Grundy. BEHIND BOMBERSMelksham unloads from just outside 50, however his kick is wide, very wide & he just sneaks it in for a minor score. The Swans have managed to outnumber the Bombers at every contest & as a result the Bombers are struggling to maintain possession. GOAL SWANSAgain Malcevski from the standing start has a snap from 35 & this time he makes no mistake of it & the Swans now lead by 13 points! GOAL BOMBERSThe long kick by Stanton comes inside 50, 3 Sydney players go to ground & Melksham is waiting behind the pack, the ball bounces to his advantage & he runs into the open goal! Zaharakis with the hurried snap from the forward pocket, his kick goes out on the full, he had more time than he realised to steady & have a shot. GOAL SWANSThe Bombers turn the ball over at half back, the Swans send it to the top of the goal square, Parker takes possession in the goal square, gets around Baguley & GOALS! BEHIND SWANSMalcevski receives the handball 35 out, he snaps from the standing start but sprays the kick to the right. The Swans have plenty of numbers down back & it is making it difficult for the Bombers to get clean possession inside their forward 50. Myers bombs the ball inside 50 but his kick goes out on the full. GOAL SWANSThe ball is thrown in 25 out from the Swans' goal, neither ruckman wins the contest & somehow, in traffic Mumford gets the kick away & bombs it through! McVeigh receives the handball 55 out, he unloads from 50 but it's a poor kick & it goes out of bounds. BEHIND BOMBERSBellchambers stands tall in the pack & takes the grab, he lines up 43 out on a 45 degree angle but narrowly misses to the near side. Both teams are getting plenty of numbers around the ball, due to the wet conditions we have had a number of stoppages with neither team able to generate run. BEHIND BOMBERSCarlisle bombs the ball forward & Winderlich takes the sliding mark, he lines up 52 out on a slight angle, distance is no problem but he sprays it to the left. BEHIND SWANSSmith takes the grab on the wing but receives a 50m penalty after Bellchambers infringes the mark, he lines up 45 out on a slight angle but sprays the kick. 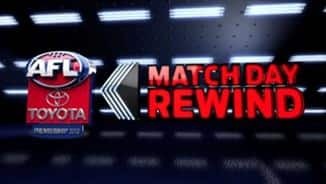 BEHIND SWANSSydney win the ball out of the middle & bomb it inside 50, the wet conditions means no one can complete the mark, Jack snaps but he sprays the kick. The siren sounds, the umpire goes BANG & we're underway in these wet conditionsthe Swans win the ball out of the middle. Welcome to the SCG where Sydney host Essendon, there has been a late change for the Bombers with Howlett being replaced by debutant Hams. Welcome to SCG for the Sydney Swans v Essendon Round 10 clash. ADAM Goodes has managed to set aside a week from hell to lead the Sydney Swans back into the top four with a 44-point win over Essendon at a rain-soaked SCG. Racially vilified twice in the most tumultuous period of his glittering career, Goodes kicked four goals to shine in a wet night as the Swans claimed a well-deserved 17.13 (115) to 10.11 (71) victory in front of 29,792 fans. Swans coach John Longmire, who had an emotional week himself trying to support the club champion, said it was impossible to comprehend what Goodes had endured over the past nine days. Nevertheless, his star's resilience didn't come as a shock. "Nothing much probably surprises me with Goodesy," Longmire said. "There were times during the week when he was exhausted and … he was still pretty tired on Thursday and then he freshened up yesterday and felt really good today, which is a real credit to him." Josh Kennedy, Jarrad McVeigh and Craig Bird were all influential, while Heath Grundy stood tall in defence and debutant Tom Mitchell excelled when he was subbed in for Tommy Walsh. Walsh sustained a nasty looking leg injury in the second term, while Essendon's Courtney Dempsey was taken from the field on a stretcher after Nick Smith crashed into his back. The Bombers were a step short for most of the evening, with Brent Stanton (36 possessions, seven clearances) their most damaging player and Stewart Crameri, Brendon Goddard and Jake Carlisle kicking two goals apiece. 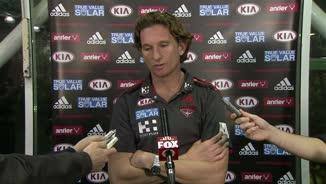 "I thought we played well for patches of the game, we just couldn't probably go with Sydney for the whole game," Bombers coach James Hird said. "We had a lot of inside 50s, but the quality of our entries wasn't as good as the Swans. "They are a terrific team." The Swans, who are currently missing Lewis Roberts-Thomson, Rhyce Shaw, Alex Johnson, Sam Reid and Marty Mattner and can still boast seven wins and a draw from their opening 10 games. Essendon meanwhile, has now lost three of its past four games to drop out of the top four for the first time this season. After such a difficult period, every time Goodes became involved in the play it was met with thunderous applause by his adoring home crowd. Held to just two touches in the first quarter, he set the SCG alight with some trademark moments of magic late in the second. Firstly the 33-yer-old galloped more than 70 metres across the ground to corral Michael Hibberd – 10 years his junior – and bundle him over the boundary line. Mitchell then sent the ball inside 50 for Goodes to outmark Carlisle and his set shot sailed through just before halftime to give the Swans a three-goal buffer at the main break. While he seemed to put his troubles behind him when he took to the field, teammate Jarrad McVeigh made the admission after the game that Goodes' recent troubles will stay with him forever. 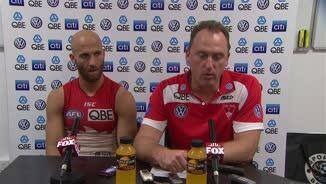 "We didn't talk as a group, but it was tough to see him go through that," McVeigh said. "From here on in we'll all forget about it, but it'll still be with him, so we'll have to continue to support Goodesy throughout the rest of his career. "We know we've got a long way to go to stamping this (racism) out, so Goodesy will always be thinking of it, so we'll always have to support him." 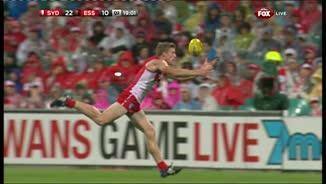 Sydney Swans: Tommy Walsh replaced by Tom Mitchell in the second quarter. Essendon: Scott Gumbleton replaced by William Hams at half time.